Zucchini muffs! Like more PLEASE. They’re big, puffy, and crackly on top, and beautifully moist and deliciously sweet inside, and perfect for all your Monday breakfasts and second breakfasts. And Wednesday lunches and post-lunch snacks and Friday afternoon munchings and Sunday bedtime treats. No one can be everything to everyone all the time except I’m 99% sure these pups can be. So we were at the cabin for two weeks, and now we’re back! It’s sad to be done with vacation because I love love loooove vacation. Also: sun. My tan lines are out of control and I secretly really like it, because if you ignore the lines it’s just TAN. But all that being said, it feels good to be back in our little love nest of a home. One thing: the cabin kitchen is about 80 times nicer than our humble yum sweet home kitchen. It features all the best appliance brands with little warning alarms, bells and whistles, and every kind of built-in schnazzery, but somehow I’m still really happy to be back in my tiny + outdated personal cooking space. Me and the orange cabinets and the no dishwasher and the mystery fridge that was rescued out of the depths of the basement… we all do just fine together. I made these muffins about fourteen million times while we were at the cabin this year because 1) summer joy is watching the sun rise over the lake with a pot of coffee and a plate of fresh muffins by your side, seeeriously, 2) all the zucchinis are here there and everywhere, and 3) I was trying to develop a zucchini muffin recipe to fit my tastes and my new sugar selective thang. Requirement: must still be absolutely delicious. Healthier muffins? I hate to say it, but they are almost always blech in your mouth. Oat flour, take your gummy, dry, heavy self and go back to where you came from. Through the millions of test muffins that came through the kitchen over the last few weeks, there were a few batches that my sweet family choked down (“No, really, they’re pretty good!” –> that’s called Minnesota nice) and then there were a few batches that made their way down to the lake to fulfill their ultimate destiny as duck food. High expectations is the name of the game here. I refuse to take part in the eating of muffins that is not a completely spectacular experience, even when they’re made without the regular muffin heroes (shug and flour and butter), hence the fourteen million attempts and good news: the eventual WIN! When I eat a muffin, I want big puffy tops, moist texture, not too dense and not too light, and light golden brown. And then I get obsessed and keep adding and subtracting and tweaking and sampling the recipe until all my hard work (ahem, muffin-gorging) pays off they turn out just how I want them. Also known as I get very lucky. Also known as Very Yummy In My Tummy. Did I want to glaze these with the maple glaze from that healthy pumpkin muffin recipe? Yes. Am I completely stumped on how to make a glaze without refined sugars? Yes. Please help me if you know the way. It’s the one sugar thing I can’t seem to figure out. I’m telepathically willing you all the best zucchini muffin making on this first Monday in August (whoa). Can you hear me in your head? Just listen really close. I’m saying: healthier honey and olive oil zucchini muffins for life. 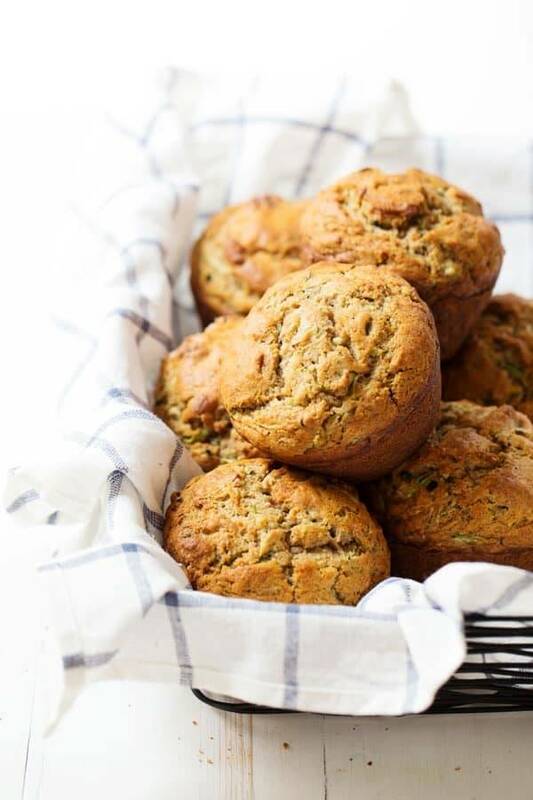 These Honey and Olive Oil Zucchini Muffins are made with healthier ingredients and no refined sugar. Super moist and delicious with big puffy tops! Preheat the oven to 350 degrees. In a mixing bowl, combine the zucchini, eggs, vanilla, olive oil, maple syrup, and honey. Stir gently until mixed; set aside. 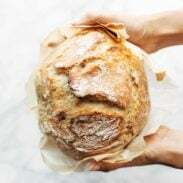 In a large mixing bowl, combine the flours, baking soda, baking powder, salt, and cinnamon. Stir to combine and make a well in the middle. Pour the wet mixture from step one into the well and stir just a few times until barely combined. Overmixing makes the muffins tough and hard, so I try to limit myself to 15 big around-the-bowl stirs. Pour the batter in a muffin tin greased with nonstick cooking spray or lined with paper cups. You should be able to get 6-8 jumbo muffins or 15-16 regular sized muffins. Bake for 20 minutes or until the muffins are golden brown and the tops spring back when you press on them. You can definitely get by with less sugar in this recipe by reducing the amount of maple syrup and honey. However, I liked the combination of both sweeteners together much better than either one of them on their own (for both taste and texture), so keep both if you can. Nutrition facts are for 1 muffin when you make them “regular sized” (15-16 in a batch). PS. This is completely unrelated to muffins, but you all are home geniuses and I love polling you for your expertise on these things. We are finally getting around to re-painting and de-gunking our (currently magenta, thank you very much previous owner) front door this week. 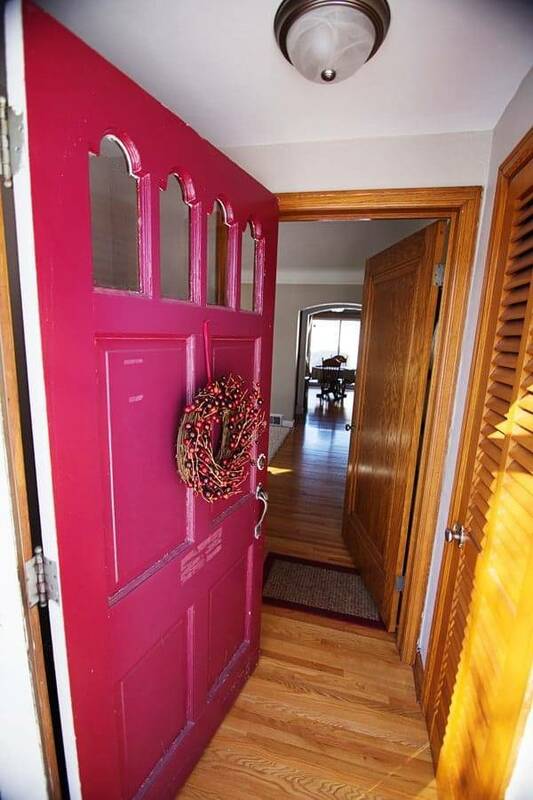 The door is very old and heavy and extremely beautiful and I l-o-v-e it, other than the very bold, almost-red-but-not color. Unfortunately I think it’s too far gone to remove the paint and try to refinish the wood, at least for our limited DIY selves, so we need to pick a new door color. Our house is white and our shutters are black, or brown, or just sort of plain, so right now I’m leaning towards a coat of cobalt or navy blue for the door. I have visions of a cute yellow-white wreath tying it all together and being just totally old house meets modern style adorable and picture perfect. Is this a good or horrible idea? Sometimes I can’t decide if I should listen to myself. Anyone done blue and regretted it? Don’t tell me. Except do. I need your house help. I agree with Muna your pictures are amazing. It feels like I can touch one of those muffins! Mmmm… and now I want some zucchini muffins. I know what you are saying about blech muffins. I have come across a lot with our gluten/dairy/egg free family. I think Navy blue would be beautiful. But, I have complete inability of making a decent looking home. Like complete. It is sort of sad since I am an artist. I think navy would be great! Also a deep dark red would go beautifully. I saw a white and black house the other day with a bright yellow door and it definitely did not work, so stay away from that! That’s so exciting to hear Barbara! Thanks for sharing! I have a TON of zucchini right now so I’ll definitely be whipping up a batch of these! 1. It sounds like you eat muffins just like I do (and cookies, for that matter): as meal replacements until they’re gone! 2. These muffins sound so delicious and I can eat lots of them because they’re healthy, right? 3. Instead of a glaze, what about just eating them warm and drizzling on some more honey? And a little butter if you’re feeling adventurous… mmm. 4. I love the idea of navy or cobalt for the door! It’d look great with the white! And it is a super gorgeous door. These look great; can’t wait to try! Is the nutrition info for a jumbo muffin or a regular-sized muffin? Yes, yes yes! A good healthy muffin recipe. These are rare! Thanks! I vote navy for the door. I love navy, yellow, and white together! Lindsay, I’m reading your lovely post about healthy zucchini muffins as I’m drinking my coffee, and choking down one my own (test batch #2) healthy zucchini muffins. I tried the oat flour thing (ground up in the blender) and each of my muffins weighs about two pounds! Haha! Talk about dense! Think I’m going to skip test batch #3 and just make yours! Love, love, love, following your blog. Thanks for all you and Bjork do to share your wisdom with us! Gosh, the oats! It’s like they turn to bricks in the oven. I felt like I even ground them up so well, nice and fine and light, but I think it’s just too heavy for muffins. I’d be curious to know how to successfully use oat flour, though, because there has to be SOMETHING it’s good in, right? I was really interested to read this recipe, Lindsay, because I tried making some healthy zucchini muffins a couple of weeks ago and they were a COMPLETE FLOP. Absolutely awful. I tried to convince myself they were okay and ate my way through about 3 before dumping the rest in the bin. So …. thanks for doing all the dirty work and eating all the previous bad versions of these because now I don’t need to do it! 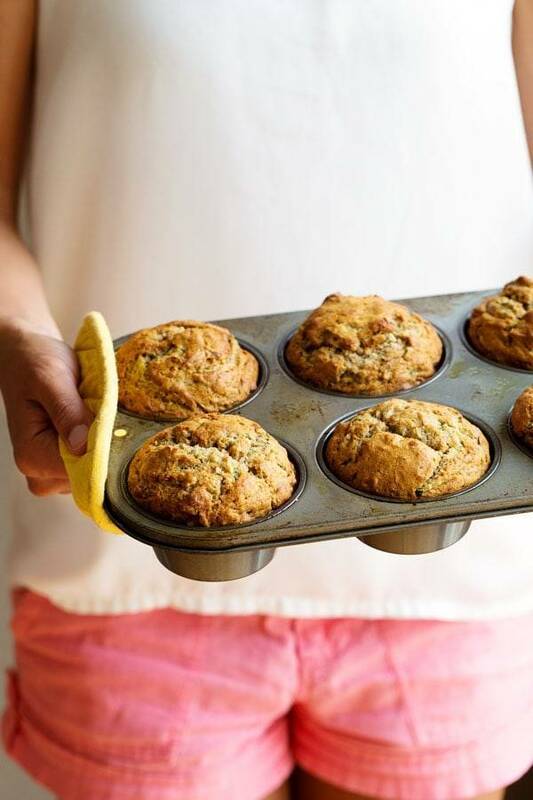 We usually make zucchini breads with our garden surplus, but these healthy little muffins are a great idea. We’ll give them a try! I have a very similar, very old door. Not too exciting but we painted ours a matte black with brushed nickle( I think?) hardware. conservative and quiet, but nice. Conservative and quiet is our style motto. hahaa. 🙂 I guess I never thought about black but now that you mention it… maybe I’ll look at that. Because with some colorful flowers and nice green grass around the front, that could totally work. I’m on a huge muffin kick these days and also wondering what to do with all this zucchini!! Man, you really saved the day. I think I would like it if it were red, but the magenta… I don’t know. It just feels a little weird to me. These muffins look amazing – I love baking with zucchini! 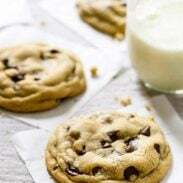 And I love that they are healthier – I’m always trying to healthify my baked goods, especially when it comes to breakfast! I feel the same way about my tiny apartment kitchen…whenever I’m at my parents house in their big fancy kitchen, I think I’m going to want to bake a million things – but I end up missing my kitchen!! I’d also like to know the serving size for the nutritional info given? Hi Allison! I added a note – it would be for one muffin when making a batch of 15-16 (standard muffin tin size). A good healthy muffin recipe. Can’t wait to try it. Thanks, Lindsay! Alison, I was thinking the same thing about the oil. Let me know how it goes with the applesauce. I made these yesterday using a half cup applesauce and a half cup olive oil. I also increased the cinnamon to 2 teaspoons. They came out just perfect, so light and fluffy and moist. This recipe is definitely a keeper. About the front door. . . my vote, a fantastic purple (no really, I’ve seen it, very cool) or an amazing red, or aqua (you know, the “in, really cool” aqua). To me, the door is a hint of what is to come. . . so it should be a bit of a “sneak-peek” of what is in the inside of your house. So peruse your interior. . . that’s all. Healthy muffins are the best! It’s like dessert for breakfast. I like how you used natural sugars and olive oil. Being creative in the kitchen is a must as well, so bravo for experimenting until you got the perfect fluffy muffins to share with us. P.S. You mentioned you were skeptical about hand in images in your amazing food photography book. Well, you pulled in off nicely for this recipe. It adds a warm, inviting touch to the muffins. Those muffins look awesome! I just painted an old bed with Annie Sloan Emperor ‘s Silk (red) Chalk Paint with dark wax in nicks and crannies….that would look wonderful for your front door. Lots of character!! Anyone else try Annie’s Chalk Paint? No dishwasher!? I don’t know how you do it. That makes your recipe creation 10x more impressive, and I was already impressed! These look great! I’ll be making them soon. I think a blue door would be great…though when I was reading quickly I read the bit about the yellow/white wreath and thought you were gonna do a yellow door and now I think I pastel yellow would be so pretty, too!